Here are some basic background about Portuguese egg tarts. It is evolved from "pastel de nata", a traditional Portuguese custard pastry that consists of custard in a crème brûlée-like consistency caramelized in a puff pastry case. It was created more than 200 years ago by Catholic Sisters at Jerónimos Monastery (Portuguese: Mosteiro dos Jerónimos) at Belém in Lisbon. When we talk about tart/pastries, we always refer to European styles'. 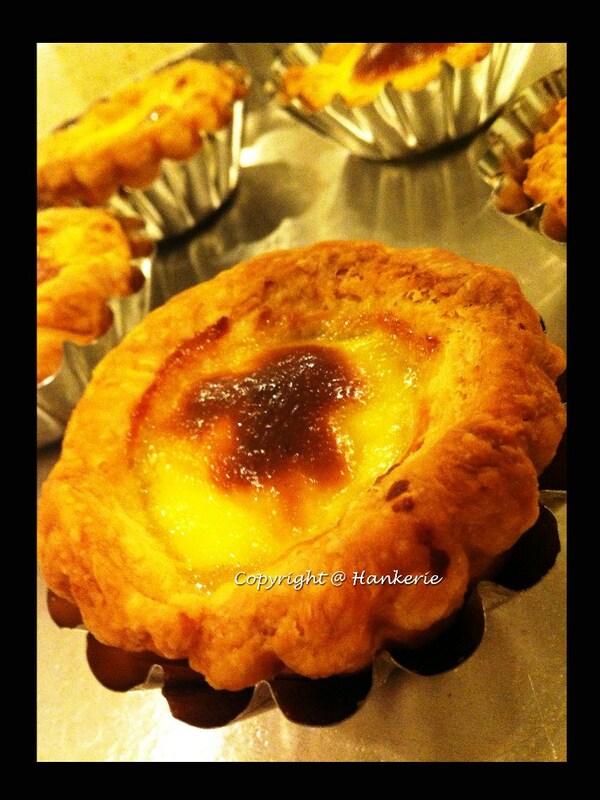 In fact, in ASEAN countries, Macau is famous with its Portuguese Egg Tart. That's why today I choose to make this to participate Janine's hosted event. Seriously, I prefer to eat Portuguese egg tart rather than normal egg tart due to its layered crust. As such, I customized it to have more crust rather than custard filling, which is rather fattening and contains high cholesterol. Remember, eat healthy! Portuguese Egg Tarts! Hanker, is this tart pastry the same for the strawberry tart pastry? @ Wai Leng: The Portuguese tart tend to more flaky and layered. Also, this tart is a bit salty whereas the strawberry tart is a bit sweet. Is this really that simple? Must try? Egg tart!!! My favourite!! I prefer a more custard in the middle. Is ur crust really layered?? Cant see though. @JT: In fact, I prefer more custard in the middle but I scared of eating too much custard. Yes, it’s layered, you cant see clearly as the photo is too dark when I took it using my Iphone. Whaat???!!! shouldn't u use your lumix instead?? u are very particular with photography no? And what's wrong with too much custard?? @ JT: My lumix is outdated now, and difficult to focus on food whereas iphone4's camera is easy to handle and focus. Too much custard = KC dont like so much custard in the tart. Next time i want a big one with many custard ya, hahhahahha.